I know a few people from my orientation group only did four weeks with a trainer instead of five, I don't think they will shorten it more than that though. I have to say again though, you are making a great choice by going with TMC. Just show them you are willing to work hard and you'll do great and make good money. Well I'll do whatever they require, just excited to get started with a new career. I'm glad to hear you like it there. It was my first choice and if what I've read is true, I can't help but believe it's an awesome place to work. So I'm headed to TMC Transport's training a few days after Christmas, anyone have any input on what to expect. I know one guy here has a blog on it, Steve, I believe is his name. I read them and it is great info. Just wondered if anyone else had any input. I guess orientation is two weeks and then five weeks out with a trainer. Is that five weeks time set in stone? I'm not new to truck driving, just OTR. I've driven in the oil fields (Schlumberger) and construction. Also did part time driving with McCorkle Truck Lines hauling frac sand to frac locations. Just wondering if it's possible to cut that portion of training short. Thanks everyone, and thanks for posting your experience Steve. I talked with them today and have been accepted. So I'll be heading to Des Moines the 30th. Not looking forward to the cold, lol. Ready to get through training and into my own truck. I'm new to OTR, but have been driving off and on in the oil fields for years, so I know how to handle a truck, just gotta get the other stuff. Haven't been on here in a while and thought I'd give an update. I finished up my school yesterday. Top of my class. Passed all test for all endorsements (except passenger, didn't take it). Just waiting on background check for hazmat now. A personal victory is that I passed every test first time up, so no repeats. Yesterday, my instructor told me "there is nothing else I can teach you." I'm sure its not the truth, but It was a nice boost anyway, lol. I'm waiting on TMC Transportation to finish running all their checks on me, and hopefully I'll be heading there. If anyone has any experience with TMC, I'd love to hear about it, good or bad. Nice job on acing the endorsement tests. Try to learn what you can in the next weeks at school. I'd suggest Schneider Bulk but we don't allow pets, and riders are allowed only after 6 months of employment. If you can accept that, go be a pumpkin tanker yanker! Awesome training, awesome company, awesome pay. PM me and let me know if you have any specific questions. I didn't know Schneider had a bulk side. I pulled some bulk rigs with McCorkle truck lines several years ago. Frac sand mostly. I'll check them out, thanks. Well, 4 days into my school and as of today, I have passed all of my test. As soon as I can get printed and background check done, I'll have every endorsement except for the passenger stuff. Have no intention of ever driving a bus. And since I already have my class A, I don't have to worry about anything else, just ride out the next three weeks of class. 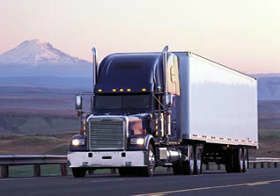 What companies should I be looking at for a first time OTR driver? Any to stay clear of? Not real concerned about home time, but would like to get home every two or three weeks anyway. I am looking for nice equipment (don't want to live in a junk pile), a rider policy for more than just my wife, and would like a pet policy (but not a deal breaker). I figure pay will be pretty much even across most companies for a greenhorn. Lol!!! That's hilarious. Yea, I haven't heard much good about owning your own rig rig these days. So glad our country has gotten to the point that it's almost impossible to start and grow your own business from the ground up, unless you start out rich. My father started with one truck and trailer and built a very successful company before retiring (He retired while I was in the military). But, that was 50 yrs ago when he started. I was just curious of y'all opinions on purchasing and operating your own rig. Recommended, not recommended? Pro's, cons??? I'm just getting started and I will not be leasing or purchasing anything, I was just kinda thinking way down the road. How do you guys stay in shape or get in shape on the road? Just don't want to put on a bunch of weight. All my jobs up to this point have been manual labor stuff. Wow. The amount of response here is great. Thanks everyone. I have been away from here a couple days so I am just now seeing this. I went ahead and took a plunge. I payed out of pocket from some money I had put back a while ago. May not have been the best move, but it's done now. I start Nov 18th. I will be talking to companies between now and when I finish about employment. So I was planning on going tomorrow and signing up for a school. Does the school really matter as long as you get 160hrs? It's at the local college here. My only concern is after graduating a company not wanting to accept my cert. I agree. I've had bulk trailers and especially ready mix trucks in places I wouldn't take a 4x4 pickup, but I guess that doesn't qualify me to keep a rig between the lines. Oh well, it's their game and if I wanna play, gotta play by their rules. I'll prob be going to a local school. Don't want to tie myself into any one company just to "pay back" the training. It's not too pricey, and gives me the freedom to check multiple companies out. Well, looks like I'm gonna just bite the bullet and go to school. After talking to a couple places, as it stands, my CDL that I've had for 15 years is useless since i never drove OTR. Hopefully the school doesn't take too long. I'm out of work and need a job ASAP. Well, as the title says, I'd like to get into OTR, but lack experience. Here is a little background on me. I'm 33, got my CDL back in '98 as soon as I turned 18. I have driven off and on throughout the years, oilfield, ready mix, and other local stuff. My family owned a small dump truck company, so I never went to a "truck driving school." (They retired and sold out while I was in the military). So far I've had zero luck even getting a company to look at me since I have no OTR experience and no school. What can I do? I have a clean driving record, and can handle a big truck without any issue. I do not know the paperwork side of OTR though.